As a student of photography, one becomes easily enamored by the many techniques and creative advancements available in the digital era. Whether it be high dynamic range photography (HDR), light painting, star trails, compositing, etc…, there are numerous step-by-step tutorials that can be found within a few strokes of the keyboard and a quick internet search. It is really great to have such an extensive library of information at one’s fingertips and it is hard to resist delving in head first into the latest imaging trends to see how they work and add them to your photographic repertoire. Although all these amazing techniques are valuable, one important thing to remember is that no matter what technique you use, the composition, lighting and subject of the photo itself needs to still be the strongest consideration for your artistic vision. A technique or cool trick does not replace fundamental concepts. Come on, when the HDR craze was big, we all stepped out of our front door and bracketed some shots of the street, just so we could over-process them into a post-apocalyptic, nuclear explosion of dynamic contrast and color. I know this is the first thing I did. I was so proud of myself for producing a completely and utterly awful image. The problem was that the focus became more about the technique then the actual photo. Don’t, get me wrong, learning these techniques is extremely important and doing them poorly at first is absolutely a necessary part of the learning process. We all gain experience and understanding from our less than wonderful endeavors. I wanted to present an example today from my own work where I decided to indulge in a technique and got two very different results. Last year, prior to the dangerous fires that ravaged the area, the Shutterhogs found themselves basking in the glory of Yosemite National Park in California. If you have never been, the glorious vistas, vast waterfalls and amazing rock formations are truly a spectacular sight and make for easy camera fodder. We had unexpectedly coordinated our trip around the presence of the full moon and quickly decided that we would focus much of our energy on some night photography and try our hands at capturing the elusive lunar rainbow that forms as the full moon reflects off the mist of Yosemite Falls. Now, I have to admit I have not done much night photography and figured that in addition to trying to capture the ethereal “moon-bow”, it would be a perfect opportunity to try a new technique and take a stab at capturing some star trails in the night sky. My experience with star trails up to that point was at absolute zero and I had only seen the many beautiful photos online. Yes, all of us start at ground zero at some point and have to take that fearful first step at trying something new. We quickly perused a few quick tutorials online (see tutorial here) and set out with hope in our lenses that we had learned enough to make it work. We took two series of photos to convert later on into star trails. 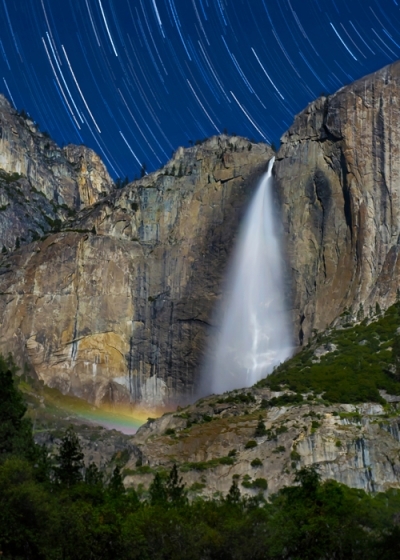 The first was up at the Vista View point that gave a picturesque view of the Yosemite Valley and the second was from the valley floor shooting at Yosemite Falls in eager anticipation of capturing that crafty lunar rainbow. Both shots were completed with the camera on a tripod with a tethered remote with automatic timer in a series of 60 exposures of 30 seconds each at an ISO of 800 at f/5.6. Care was taken in each shot to try and have some sort of compositional value using the Rule of Thirds, but I will be honest, the real thrill was to have some stars streaming through the sky and hopefully a “moon-bow” to add to our photo trophy collection. Ahh! There she glows! A rainbow in the night! Stars trailing through the sky! All joking aside, I was extremely disappointed in this image. I had made a bit of a mistake and focused a little too much on the “gimmick” of capturing the star trails and the “moon-bow” and really had not given enough thought to my composition and lighting. The technique was successful, but I ended up with a very flat image that frankly was difficult to process as I tried to save the image with some photoshop magic. Now, the composition itself is acceptable, but because the moon was shining from my back directly on the falls the whole seen was dull and void of any shape or dimension as there were no shadows to make it interesting. I had successfully executed a new technique, but forgot to focus on creating a stronger artistic vision. A bit of an improvement I think, despite the lack of the infamous lunar rainbow. 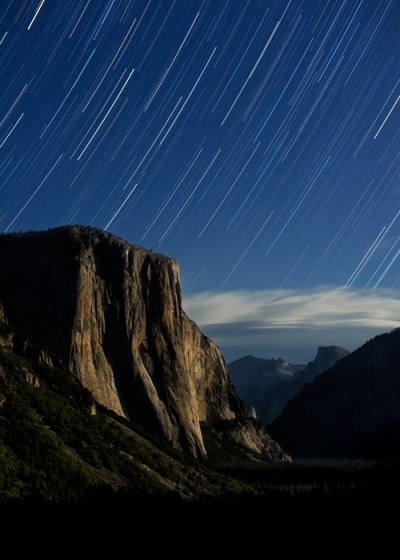 This image has a bit of a majestic quality to it, as the stars appear to be raining down upon the warmly lit monolithic surface of El Capitan. The compositional elements are all here. We have an interplay of warm and cool tones, the lines of the stars and valley floor all lead to the eerily lit surface of the massive rock, and the side-lighting from the full moon off to the right, creates deep shadows that give dimension and shape to this rock climber’s paradise. The sky, stars and clouds give an ethereal and magic quality to this image, while the gently lit, rocky surface provides an inviting yet ominous strength and danger to this massive monolith. In my opinion, this captures the true embodiment of El Capitan and why so many tourists and climbers are drawn to its grace. Here, I not only successfully learned a new technique, but also stayed true to my artistic vision. So what is the overall take home message from all of this? Techniques or “gimmicks” are very important elements of photography that help us to advance our skills, however, without our basic compositional elements they often fall short in producing the images we all desire to capture. Don’t forget to stay true to your artistic merits and take a little time, effort and thought to make sure that you are not just capturing a “gimmick”, but also producing a photo you are proud to call your own. After all, this is your creative vision and your photographic journey. Make it a good one!